Once you’ve played with LEDs, switches and stepper motors the next natural step is 16×2 alphanumeric LCD modules. These modules are cheap (less than $10) and easy to interface to the Raspberry Pi. They have 16 connections but you only need to use 6 GPIO pins on your Pi. 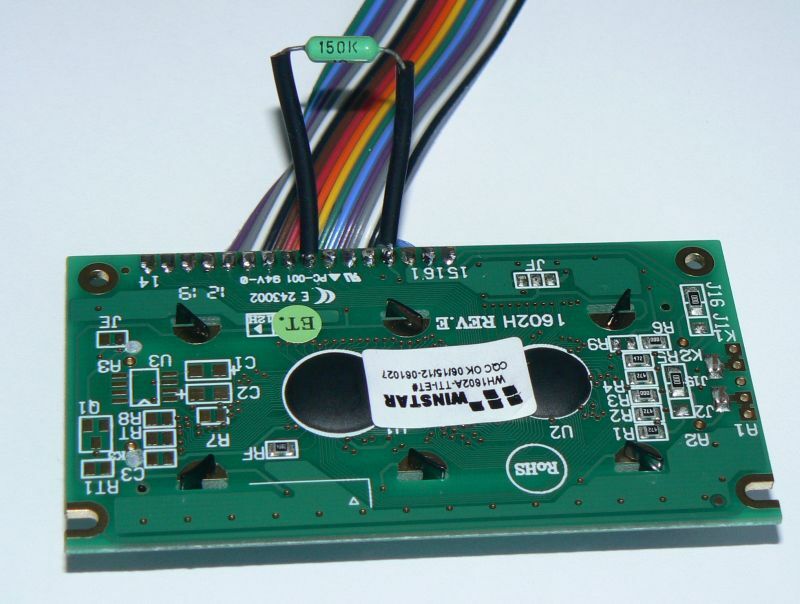 Most of the 16×2 modules available are compatible with the Hitachi HD44780 LCD controller. This allows you to buy almost any device and be sure it is going to work in much the same way as any other. There are loads to choose from on eBay with different coloured backlights. The one I purchased had a blue backlight. Usually the device requires 8 data lines to provide data to Bits 0-7. However the device can be set to a “4 bit” mode which allows you to send data in two chunks (or nibbles) of 4 bits. This is great as it reduces the number of GPIO connections you require when interfacing with your Pi. NOTE : The RW pin allows the device to be be put into read or write mode. I wanted to send data to the device but did not want it to send data to the Pi so I tied this pin to ground. The Pi can not tolerate 5V inputs on its GPIO header. Tying RW to ground makes sure the device does not attempt to pull the data lines to 5V which would damage the Pi. In order to control the contrast you can adjust the voltage presented to Pin 3. This must be between 0 and 5V. I tied this pin to ground. 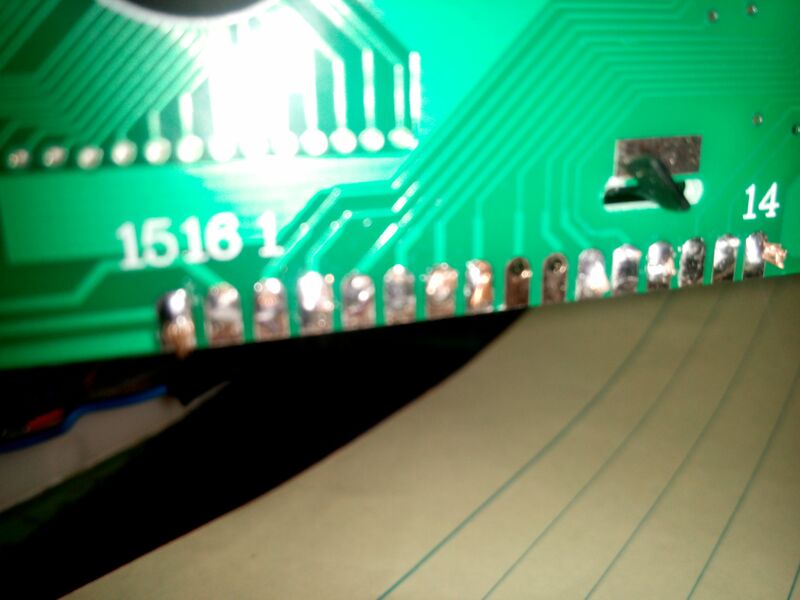 Pin 15 provides 5V to the backlight LED. It wasn’t clear on my device if this could be connected direct to 5V so I played safe and placed a 560ohm resistor in line with this pin. Pin 1 (GND), 3 (Contrast), 5 (RW) and 16 (LED -) ( should be tied to ground. Pin 2 should be tied to 5V. Pin 15 should have a resistor inline to 5V to protect the backlight. You can control a HD44780 style display using any programming environment you like but my weapon of choice is Python. I use the RPi.GPIO library to provide access to the GPIO. Additional Notes : RS is low when sending a command to the LCD and high when sending a character. RW is always low to ensure we only ever input data into the module. 8 bit bytes are sent 4 bits at a time. Top 4 bits first and the last 4 bits second. Delays are added between certain steps to ensure the module can react to the signal before it changes. The code above was inspired by code submitted by ‘texy’ on the RaspberryPi.org forum. I changed the way the bytes are broken down to bits as this significantly increased the response time of the display. Try adjusting the voltage on the contrast pin between 0V and 3.3V. Change the E_PULSE and E_DELAY parameters from 0.0005 to 0.001. Some screens are sensitive to these times and won’t initialise if they are too small. Use Python 2. I haven’t tested with Python 3 yet. Take a look at my other LCD Screen related posts which include details of the 20×4 version of the screen used in this post. 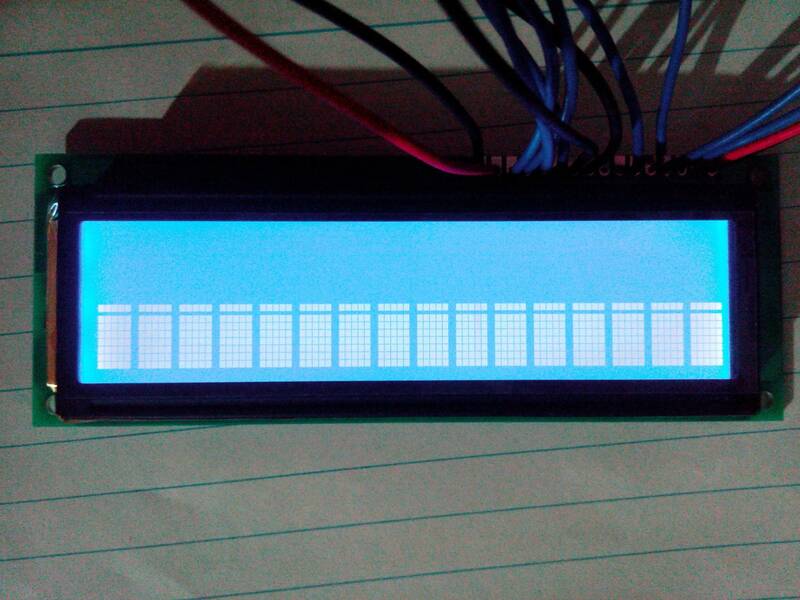 your example works fine but i’m hving problems using 20×4 LCD – what do I need to change in the script to show all 4 lines? Sorry Mr, i want to ask. I use raspberry pi 2 type b. pin 19 until 24 already for a RFID. You can use different GPIO pins but you must update the LCD_D4,LCD_D5,LCD_D6 and LCD_D7 variables in the script. 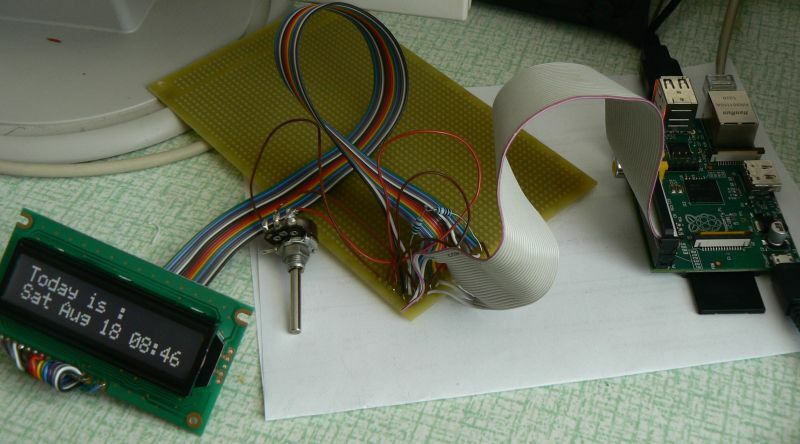 you say you wire LCD pin 1 to +5V p1_02 – but the LCD pin 01 is GND right? So under “Here is how I wired up my LCD” the LCD pin 01 should actually be to GND (p1_06) and LCD pin 02 to +5V (p1_02)? And in the schematics and “Wiring Checks” you say connect pin 1 to GND. Am I just tired and misreading? You are correct. Thanks for spotting it. I’ve updated the table . LCD Pin 1 is Ground and Pin 2 is +5V. Very nice tutorial, but there is another slight mistake. Under “Here is how I wired up my LCD” you used GPIO 7 and 8 for RS and E, but in your python code you set RS to 26 and E to 24. I had to change these lines to get my LCD working. Thanks Markus. I’ve corrected it now. The example uses GPIO pins that make the breadboard diagram easier but this is different to my real test circuit. I got confused between the two! hi I’m getting stuck with this, i cant get any output from the screen. It’s lit but nothing when I run the code. 5. And i’m pretty sure my wireing is correct. When the python’s script has finished, display fills by 32 characters of “inverted P”. It caused probably by electomagnetic noise (long wires between Raspberry and display). I solved this problem attaching resistor 150k between pins 2 and 6 on the display port. I think this is because when the script finishes the RPi.GPIO library configures all the pins as inputs. This leaves the Enable pin floating. Adding a resistor pulls it high so the screen doesn’t reset. I might give this a try on my circuit. i wired my screen up the same as yours but its VERY dark. theres no colour to the screen (i.e blue) and the character blocks are barely visible. The LED backlight resistor is 560 ohm not 5600 ohm. If you are using 3.3K then the LED isn’t getting enough current. Use a 430 instead and that should light up the screen a bit better. I have gotten everything wired up and double checked everything, though I only get squares all the way across the LCD screen. I re wired everything just to make sure it was done correctly, still the same issue. Side note: I am also a bit unsure on the need for the resistor, the LCD can operate between 2.7 to 5.5V. Is the resistors purpose to stop the LCD from pulling more than 5v? All fixed, was connectivity issues with the squares showing up. Once I had fixed that problem I then started getting weird characters showing up. That was also fixed by setting up my locale settings OR by ignoring what the SSH client sent as a locale. Everything is working good now, nice tutorial! Bit confusing in parts though. how did you fixed the squares issues? I have the same problem and I can´t find any help. Double check the contrast pin. Try varying the voltage between 0V and 3.3V. The resistor is for the LED backlight not the LCD itself. 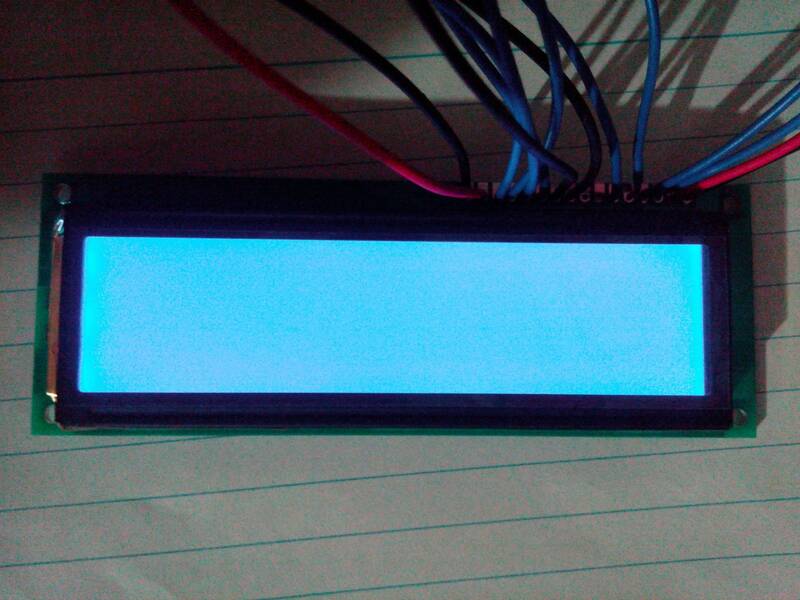 It usually isn’t clear but some LCD modules do not include a resistor to limit the current drawn by the LED backlight. So I always put one in to be sure. I’ve tried this and have a worrying problem. I don’t see any text, just black squares accross the lower line of the display. What concerns me is that the data lines each read 5v when I run the Python script. Pin 5 is *definitely* grounded, and since the Pi should only ouput 3.3v on these pins I’m guessing this must mean a fault in the LCD? Unhelpfully I’ve signed the above comment “Matt”. Apologies! I wired up exactly as seen in the diagram and ran the script. BUT lcd shows nothing. I checked my wiring and even program 2-3 times bit nothing helped. What do you think, what’s the problem?? Nice tutorial. In case someone’s looking for a full library for the HD44780 on the Raspberry Pi, here’s my attempt at doing so: https://github.com/dbrgn/RPLCD It’s tested both on 20×4 and 16×2 LCDs and provides test scripts to verify your wiring. I have just started with python and have a problem with the code. Where have I went wrong. thank you..
Hey, i was wandering: can i use a 330R resistor instead of the 630ohm?? If not can i use any of the following: 10k 1k0? Please reply ASAP! Thanks in advance and AMAZING tutorial!! (i had trouble following the table as there is no pin 6 and i couldn’t understand why so many things were on pin 6)! The resistor just limits current to the backlight LED. You could definitely use 1K0. 330 would be ok as well although that really depends on the exact specification of your module. Some modules have built in resistors. I would go for the 1K0 and see how bright the backlight is. If it is too dim then try the 330. Assuming the LED has 2V across it that would leave 3V across the resistor (5V-2V). 330ohm would mean the current is 9mA (3/330). That should be OK for most LEDs. i want to show custom characters on the LCD. You think you can extend the tutorial for this? Would be great. How to increase contrast, because my screen is very dark and text is nearly impossible to read? Thank you so much for this! Very Helpful! Can you give any info as to why you skipped some pins? Also, any idea how to hook up and use an OLED display? SPI or I2C? Pins 7-10 aren’t required as the device supports sending the data in blocks of 4 bits. This makes the code a bit more complicated but saves bothering with those pins in hardware. Could you expand on what goes on in lcd_init() please? #whilst keeping it in 4 bit mode (0010XXXX), the latter (1000 in 00101000) says it is 2 line device. lcd_byte(&H1, LCD_CMD) #Clear — takes 2ms. Hi Matt – Great tutorial – Its the clearest one on the Web that I have come across. I was wondering do you have an example where I could use the same specification display in 8bit mode? Many thanks in advance! Thanks for publish this tutorial but I’ve questions. I wired other modul on my Raspberry Pi so I can not use GPIO25 and GPIO 08. Can I use other pinouts instead of this pinouts to work both other modul and LCD together? You can use other GPIO pins. You just need to change the script to use those GPIO references instead. I have 20×4 lcd module lcm1602 with hd44780. I’m using I2c. Do you have sample code for using that with I2c on Raspberry Pi B+ ? I want do scrolling (up, down, left , right) and custom character. I’m using I2C with Raspberry Pi B+ connected to (SDA, SCL, GND, VCC). Is working, but i’m newbie and i’m interested in do more things like i said with it. Unfortunately I haven’t got an LCD module with an i2c interface so it isn’t something I can try. Your Python script is great! Thanks a lot! Is it difficult to modify it in a way that the LCD is used in 8-bit mode? I ask because I don’t need the other GPIOs and maybe when the LCD is used in 8-bit mode, lesser CPU cycles are wasted. Hello, just a newbie here..
At first, I tried everything just like what was instructed..
Have you connected anything to Pins 7-10? The back of the lcd pins were written: 15,16,1————14 but it doesn’t even light the LED backlight but if I exchange the pins 15 and 16, it does and now with white squares. so I’m using 16,15,1————14. If that is the correct pin assignment, then no, I left pins 7-10 unconnected. Hello! Can you explain the code further please? The comments in the code were useful but I want to fully understand it. I am planning to interface the lcd with inputs on my keyboard but don’t know how.. Or can you link me to a helpful guide to lcd codes? Thanks for the great code! I’ve used it in combination with a self-written code to display the temperature and humidity from one of my sensors (DHT11) on the LCD display, and even to send the values regularly to a online google document using gspread. I had another question for you- do you know of any code with which I can scroll the display for texts which are longer than 16 characters? i used this code to display data on lcd…when i used to run the code it is executed but i didn’t get the data on my lcd…… can anyone help me…..thnkss in advance…. I have setup the raspberry pi with LCD. But when i run the py file, it shows error. Delete line 7 and retype it. Looks like you’ve got a weird character in there. I’ve hooked this up thanks for tutorial. P1-06, P1-02, P1-24 and so forth. Where does the P1 com from? Pin 15 from the LCD should be connected to 5V (Via resistor). Is that also to pin-2 (5V) or can it be connected to pin-4 which is also 5V? Can I use this resistor for the project? Sorry for all the questions, it’s all a bit overwhelming and I’m trying to comprehend all the connections to the GPIO connector. Your tutorial is very good and it works indeed, also it is very clear to understand and as well clear to modify GPIO if necesary. Very well done, 10 points go for you.. !! Great Tutorial ! It helped me a lot . Do you have any suggestions on getting the string input to scroll from left to right for 16×2 lcd module . Can you please tell me how to clear the lcd after the display? Using “lcd_byte(0x01,LCD_CMD)” should clear the display. Thanks for this. Really helpful, as are your answers to other’s queries, and those of other contributors. One minor error (I think) in the programme script. Line 179 – The call to lcd_string() has three arguments -as python tells me when I exit, it only takes two. Removing the ‘,2’ cures the complaint, but I don’t know if it had a purpose? I tidied up both scripts and this is a cut-n-paste error. I’ve corrected it now. Hi This is a great tutorial,but I am getting an error.Can you help me with this? Did you download the script directly from my BitBucket repository? I2C LCD screens work but some users say you need to level shift the I2C connections between the screen and Pi. I’ve got one and it works fine without level shifting. Not sure about the second item. thank you very much. Does what it says. Yours is the third 16×2 display tutorial I have followed, and the first one that has worked. Nice job – thank you for sharing it. Check the voltage you are applying to the Contrast Pin. A trimming potentiometer is best so you can adjust it. It may also be worth increasing E_PULSE and E_DELAY constants as some screens need a bit of extra time between commands. try setting them to 0.0010. Double check your code including the indentation or ideally download my script using the link. The board mode is set so the error message implies there is something wrong with the structure of your code and that line is not getting executed in the correct sequence. Did you download the script? The “GPIO.setmode” command is in the “main” function. So the error means your script is not running the main function or you have no “GPIO.setmode” command. SIR what changes we need to do for raspberry pi 2 model b. kindly help sir as i am undergrad student and having some difficulties in it. As long as the GPIO references are correctly mapped in the Python script it will work with any version of the Raspberry Pi. Great sample, thanks a lot! i rectified my previous error. but lcd_byte(0x01, LCD_CMD) and GPIO.output(LCD_RS, mode) has runtimeError: The gpio channel has not been set up as an output. any idea? All I can suggest is using the wget command to pull the script from my BitBucket repository directly to your Pi. It sounds like you’ve got an indentation issue. I have been running a ROMAN NUMERAL CLOCK program on an 2×16 LCD on previous models fine. But found that the PI 2 model B only works if the ENABLE TOGGLE is doubled to 0.0010. Suspect the TIME routines are not handling the faster processor speed. My code is nearly identical (different GPIO pins) to what you provided because I am also using Matt Hawkins code. Thanks for this sample. I modified it for my project and worked perfectly. I don’t know if it’s coz of the soldering but.. please help me out! It maybe the contrast. Try setting the voltage on Pin 3 to something between 0 and 5V. Also try increasing the E_PULSE and E_DELAY values to 0.00010. Not working what should i do ! I followed all the steps check the connections thrice but nothing displays ! Hi Gaurish, I’ve added some troubleshooting tips at the end of the article. It is a great tutorial and I learn a lot through this tutorial. I have a question on how to scroll the text vertically since I have more than 16 characters to be displayed in one line. Please help me on this problem. Thank you very much. It’s an application called “Fritzing”. Thanks for the work and thanks for sharing! However, is anyone experiencing strange characters after a certain amount of uptime?